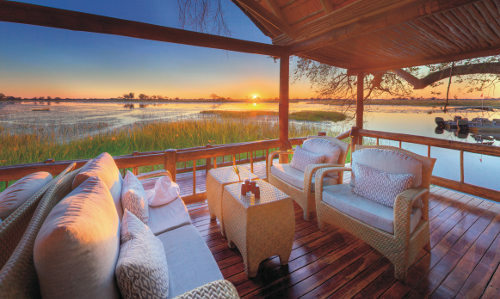 Eagle Island Lodge in Botswana’s Okavango Delta is the ultimate luxury safari paradise. Situated on remote Xaxaba Island among a web of waterways and lush vegetation, it overlooks a lagoon that attracts a breathtaking variety of big game and exotic birds. Explore the region by local canoe, set out on a game drive or roam on foot. On a walking safari through the delta you are totally enveloped in nature. You spot amazing things close-up: an insect, animal tracks, big game droppings, swarming termite mounds. These small, unexpected aspects of life often make the biggest impression. If a game drive is like reading a book: a walking safari is actually becoming a character in that book. Accommodation at Eagle Island Lodge is everything you would expect of a luxury safari experience. All luxury tents are housed on raised wooden platforms, offering great views, and shaded by a traditional African thatch roof. The large private decks are furnished with easy chairs and a hammock, ideal for viewing wildlife, or for enjoying a private dinner in complete privacy. During your stay at Eagle Island Lodge, a helicopter ride is included!